With its iGo neo Still shows that robotic technology makes a valuable contribution to smart intralogistics. The truck automatically recognizes its current orderpicker who keeps the truck moving so that stepping back on it is not necessary. 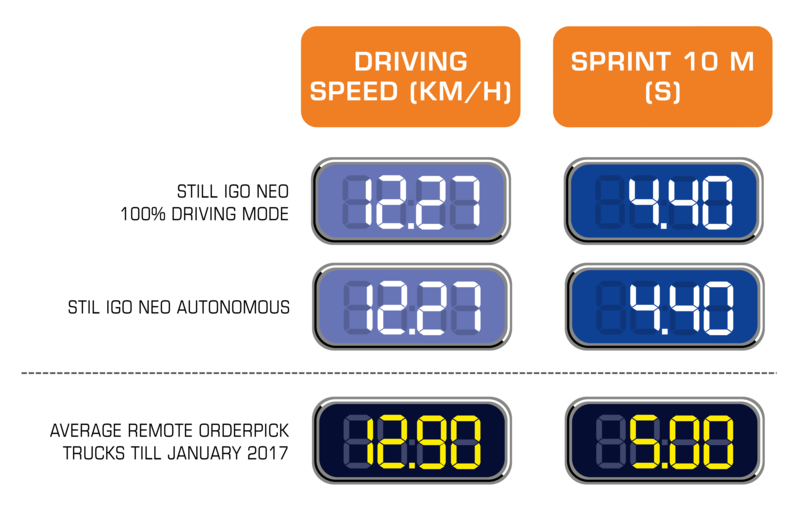 Our intensive test shows that savings are spectacular, compared to conventional, man-operated use. 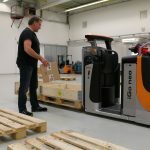 It was the fair highlight at the LogiMAT 2016: the launch of the Still iGo neo, the world’s first ‘robotic’ order picker. 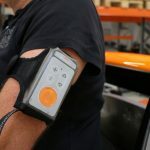 No push-button on a glove, no tapping or any other kind of remote control to tell the truck that it must drive a bit further. 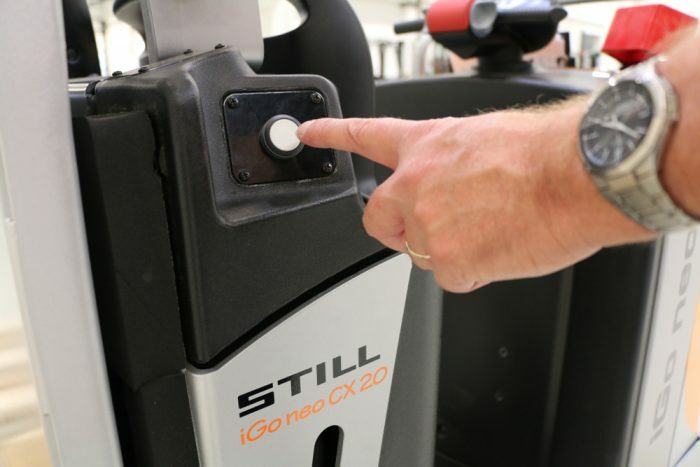 As soon as the operator dismounts and presses the button on the side of the truck, the iGo neo follows this person thanks to its 360-degree scanners. 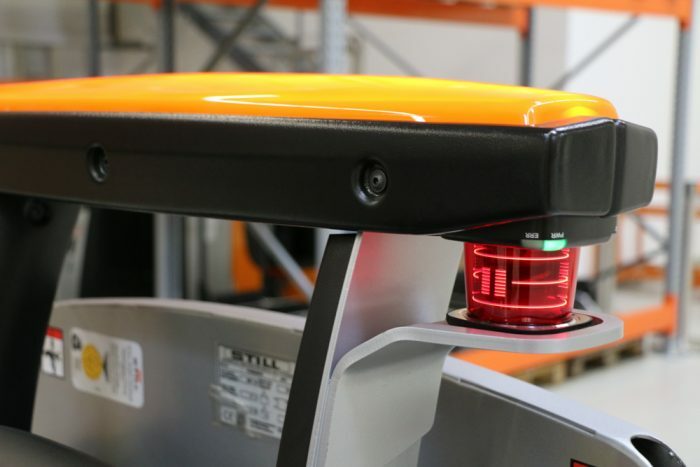 When the orderpicker goes to the next picking location, the truck follows automatically. 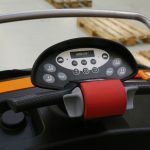 Neatly keeping into account safety distances and any possible obstacles. 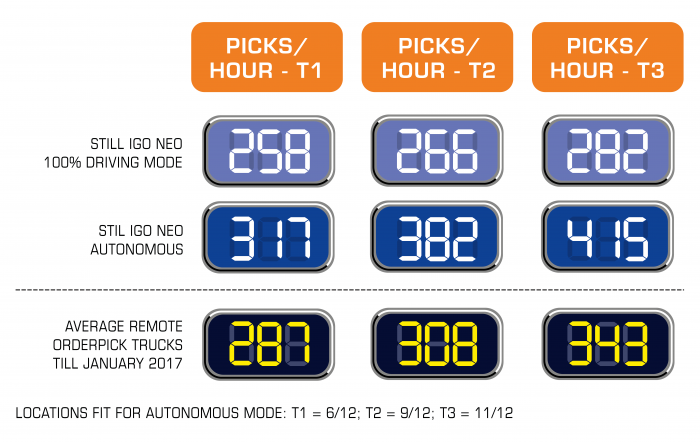 If the operator stops at the next picking location, so does the truck. Could it be any smarter? 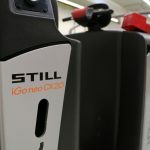 With this in mind, we started an intensive series of tests with the new Still iGo neo at our standard order picking testing track, where we test the time differences and the energy consumption at three different layouts. 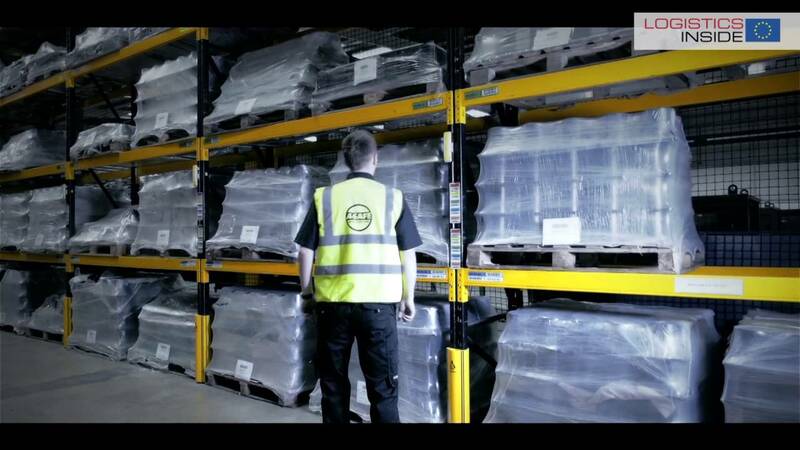 The first layout is similar to standard picking operations we’ve seen at a large international retailing distribution centre. The track contains 12 picking locations, spread out over a driving distance of 168 meters. Six locations are within a distance from each other where it is logical to walk towards the next location, rather than to drive. 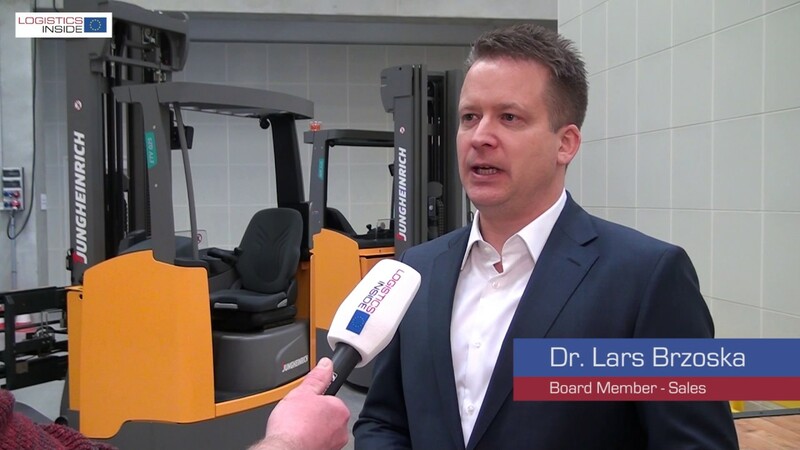 For this purpose, the truck has to be provided with pedestrian buttons or a remote control. At layout 2 and 3, the total driving distance remains the same, but the pick locations are closer together so that it makes sense to walk more often. At layout 2 this goes for 9 picking locations, where as in layout 3 this number amounts to even 11 locations. At every layout we measure time and energy to do all 12 picks. 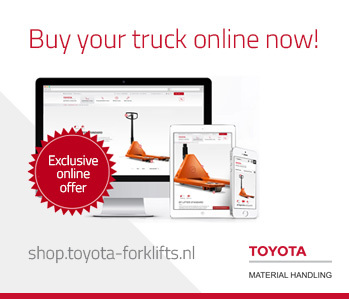 We do this in both the conventional way – by moving the truck driving – as well as in the remote controlled way, when it makes sense to go to the next picking location. 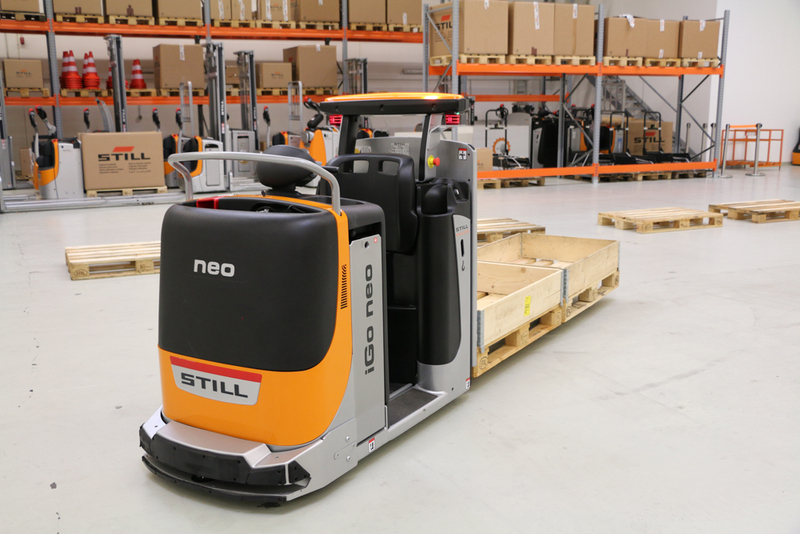 In short: the iGo neo is more efficient and productive when you use the pedestrian concept at all layouts. 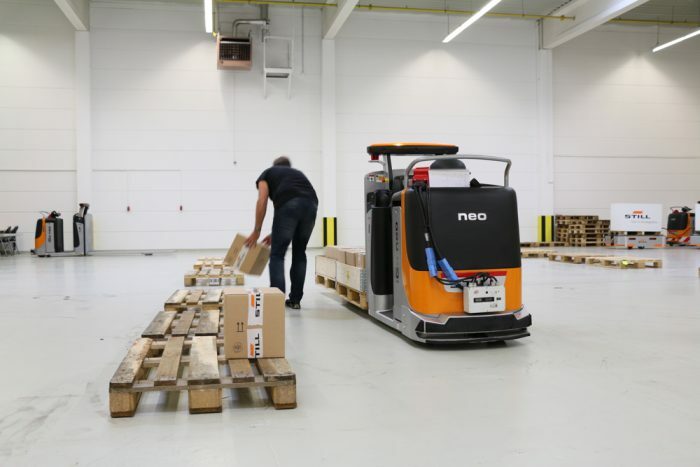 We’ve seen this effect earlier in our test with other remote controlled order picking trucks. However, the gain compared to conventionally and completely driving was not as large as expected. 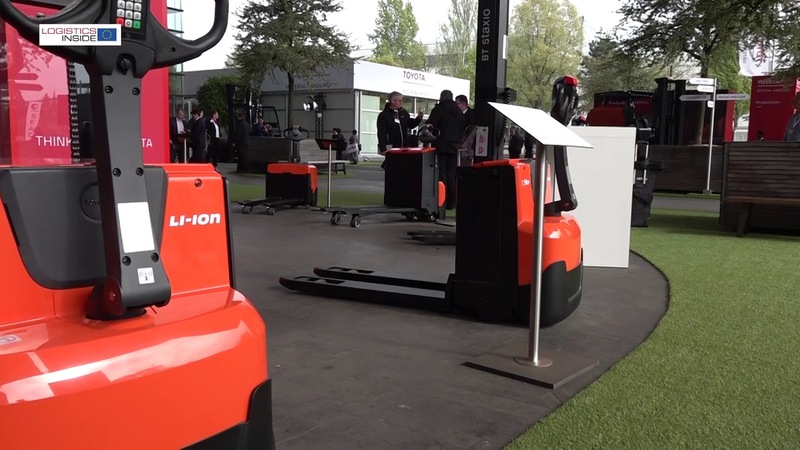 The ‘follow the operator’ concept works fine, but would be much more effective if the truck would react more dynamically to the walking of the operator. It should come straight into action as soon as the operator walks to the next picking location. And in that case not just follow the operator, but even better staying ahead of him. It is obviously better when the truck waits for its operator, than it is the other way around. Still engineers took to heart the criticism and went to work. When we returned just a few weeks later to repeat the test, differences were enormous. We made huge gains, of 22, 43 and even 47% compared to conventional operation at respectively layouts 1, 2 and 3. 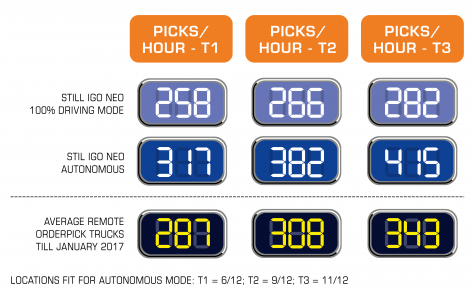 The new settings provide all the advantages the truck actually can deliver the truck, so it turns out when we get the truck to stop at the ideal next picking location by using an extra operator to drive it. 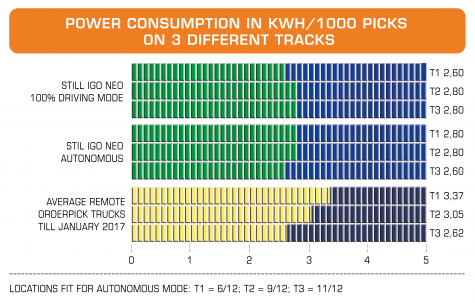 The ‘bottleneck’ is no longer the truck or its operation, but the walking speed of the operator. Perhaps it would be an option once to use roller skates. During the test it is noticeable that the iGo neo neatly keeps its safety distances. It dodges if possible and stops when it is necessary to avoid collisions. 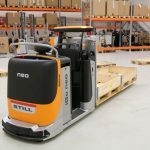 The end-of-aisle stop works accurately and so does the recognition of the operator. Yet, not everything is hunky-dory. 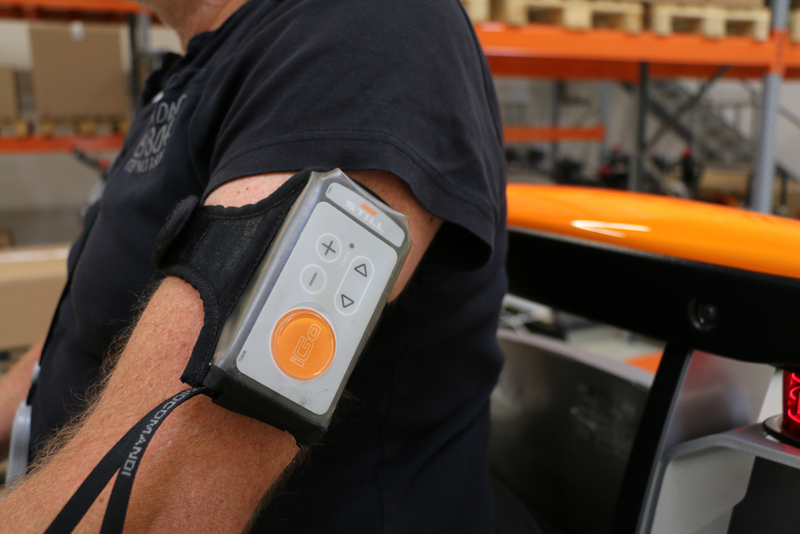 Improvements are, in our opinion, possible in the design of the remote control the operator can wear at the upper arm. Remote control? Doesn’t the truck work automatically? Yes that is correct, but by using the remote control the operator can stop it or call it to move a little bit closer. Also, it is possible to change aisle side if you have to pick on the other side. 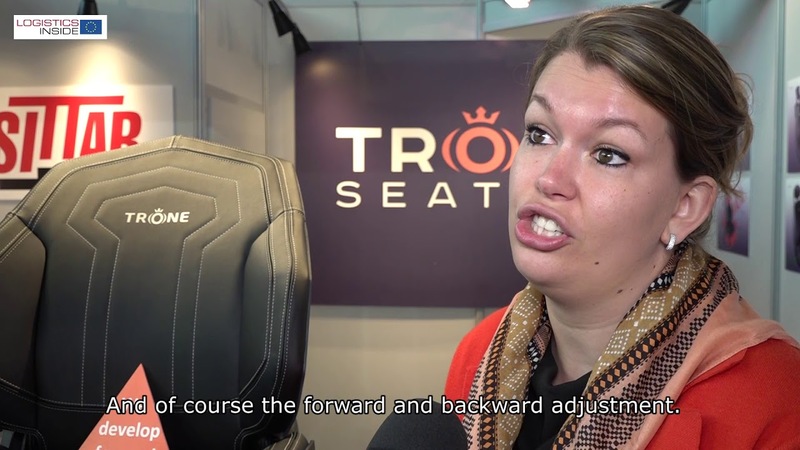 Furthermore it is possible to select one of the pre-programmed stopping locations. 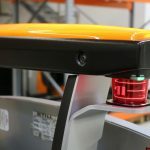 Using this option, the truck automatically provides the appropriate putting location at the pallet or container, so walking is even further reduced. In our test we obtain the best scores when we choose the second stopping location and work deeper towards the end of the fork. Sometimes however the first location is desirable. In that case it’s useful if you can easily change this. There are many more ideas for the future, when it comes to the iGo neo. 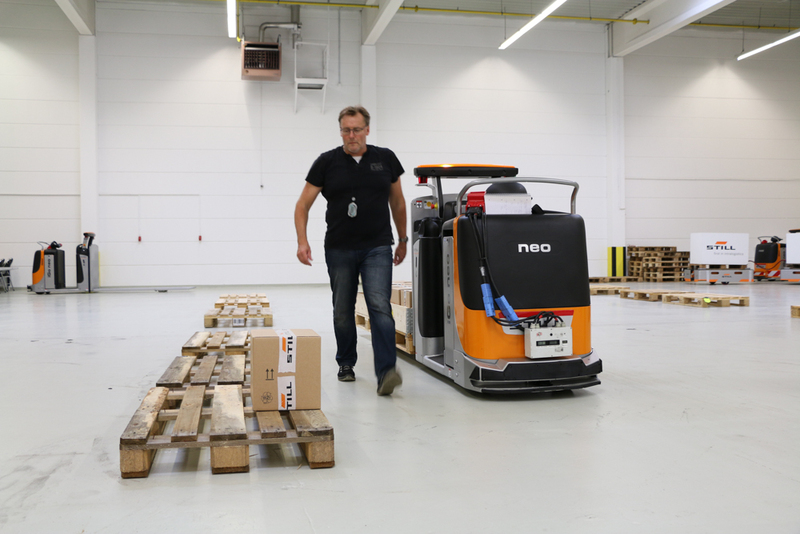 Associating tracking and aisle alignment to the truck side where the button is pushed (where the operator steps of the truck) is one of them. 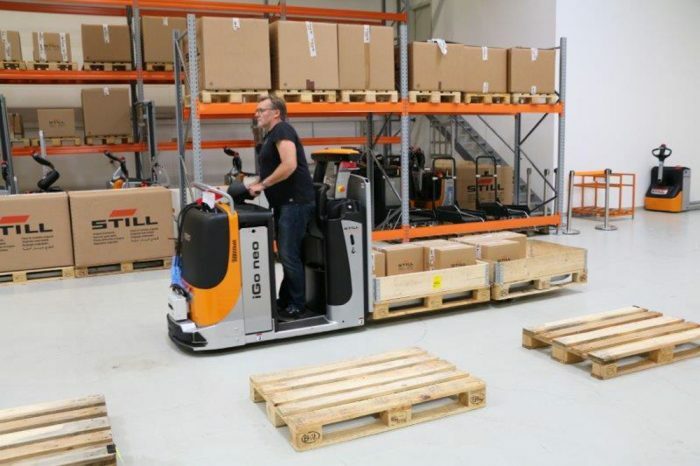 So are gesture recognition, automatic navigation over the 360 degrees scanners – allowing the truck to independently drive to the expedition floor or to another operator – an end-of-aisle stop which also takes into account bins or dumpsters on the front side of the racking, linking to voice systems, and so on. Updating the software remotely… robot technology makes it conceivable and possible. 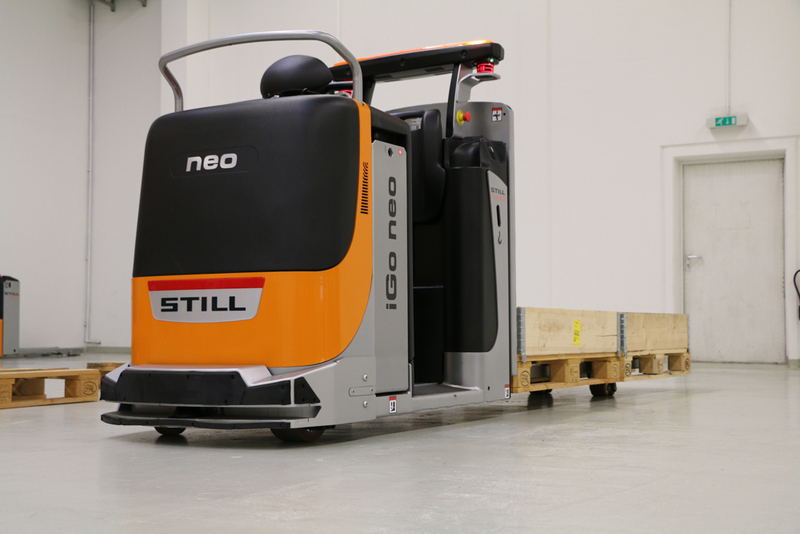 Apart from the future plans the Still iGo neo today provides the same benefits that we have seen with other remote controlled order picking trucks: working is enjoyable, easier, more efficient and much less stressful, as you do not have to step back on the truck. It also takes less energy for the truck itself. 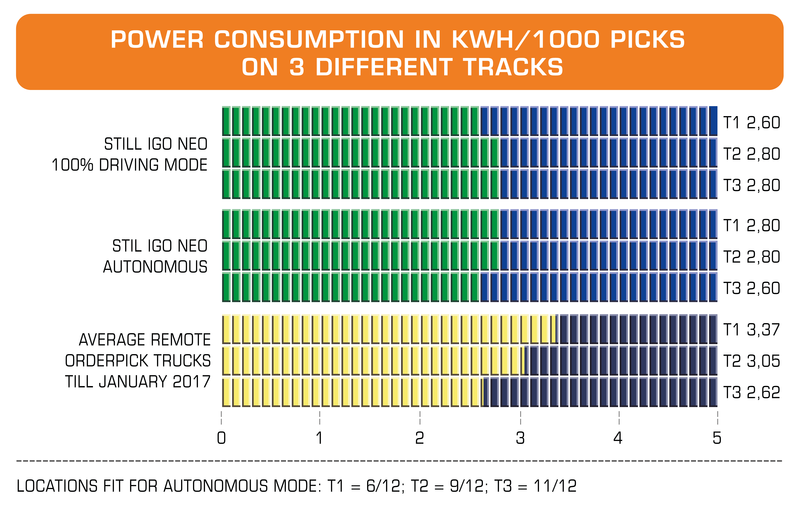 In addition, the iGo neo offers the advantage that you do not need to press a button or tap a unit to call the truck. 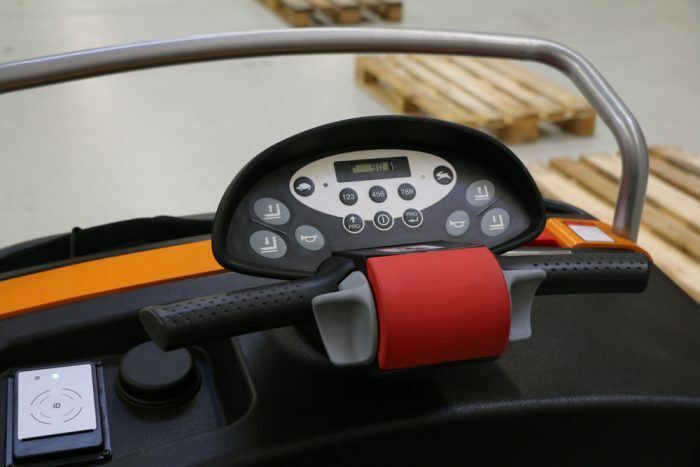 The operator really has both hands free to grab, hold and put goods. 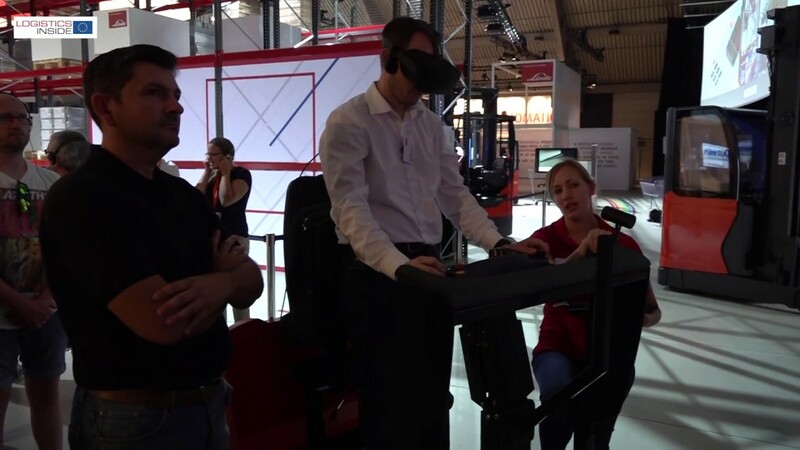 We also find that further walking distances are no longer an objection thanks to the enhanced dynamics of the truck. In other tests, the turning point was always at surely 7 to 8 meters. Now we effortlessly walk up to 10 meters before we decide to get back on the truck to drive to the next picking location. 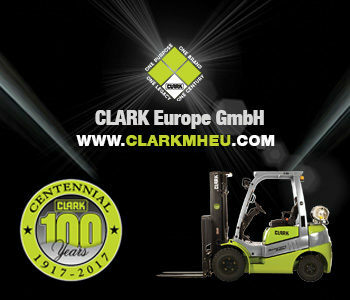 In addition, the operators own movement speed determines the speed of the truck, which we experience as very pleasant. 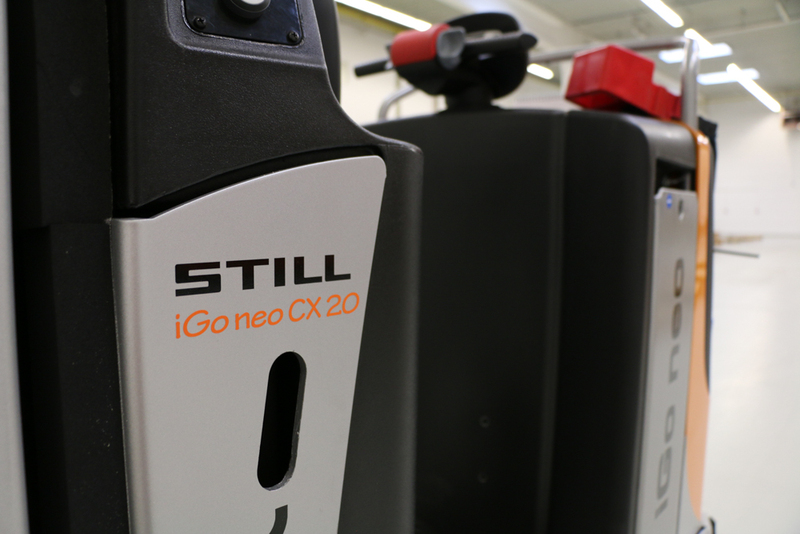 The Still the iGo neo is based on the existing order picker CX20. 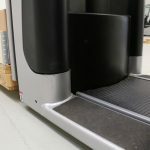 Even though the steps are low and neatly bevelled, not stepping back on the truck is easier and less stressful for the operator. The scanner which monitors a safe operation is neatly concealed in the sturdy bumper at the front. The scooter wheel of the CS20 has been around and enables easy operation. 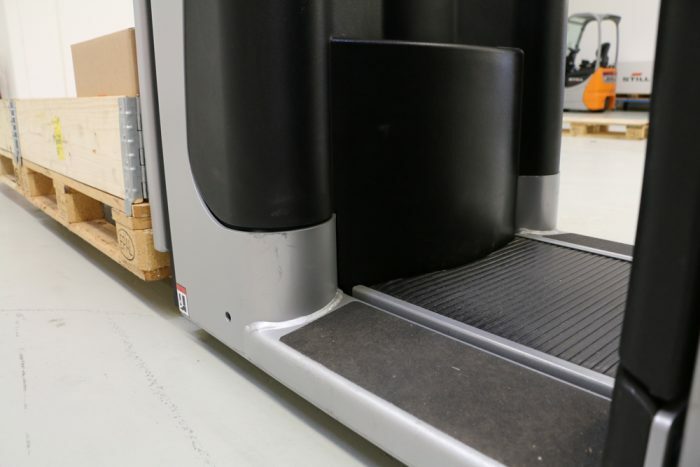 If the operator presses the button after stepping off the truck, it recognizes him as its operator and the truck will automatically follow him. Using the remote control at the upper arm the operator can stop or call the truck, choose aisle side for automatic detection, and select stopping location for the pallets or containers on the fork. 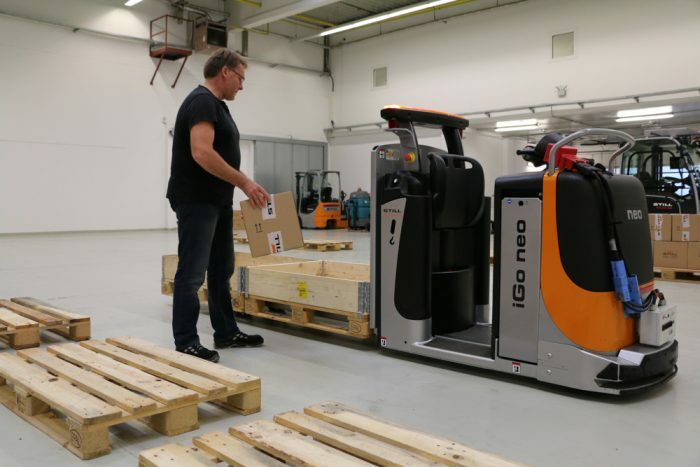 Heart and brains of the iGo neo is the combination of built-in robot technology and 360 degrees scanners on both sides of the truck. 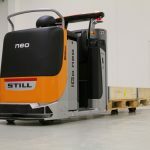 The iGo neo automatically maintains the correct safety distances from the pallet (i.e. racking). This distance can be chosen both fixed or dynamic. On our standard testing track for horizontal order picking we collect a total of 12 orders within a driving distance of 168 meters.